Product #60794 | SKU 41050 | 0.0 (no ratings yet) Thanks for your rating! 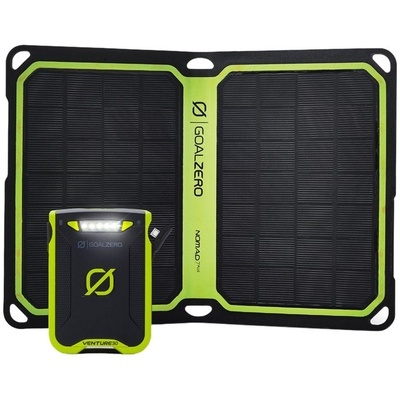 The Goal Zero Venture 30 Solar Kit (with Nomad 7+) has been re-engineered to be lighter and smarter, the Nomad 7 Plus Solar Panel allows you to recharge the Venture 30 right from the sun. The Venture 30 is IPX6 rated, enabling it to survive rain and even short dunks under water. It charges in as little as five hours via USB and also has a built-in charging tip for connecting to select Goal Zero solar chargers. The Venture 30 also comes with an integrated micro-USB cable that can be used to charge the battery itself or micro-USB devices. It is a portable and foldable solar panel that will directly charge small electronics like smart phones and GPS units, or Goal Zero battery packs. This unit puts out 7W of power, and you can chain multiple Nomad units together to increase wattage output for added versatility.